After getting these items, you are simply going to sketch a very basic pumpkin face onto the shirt with your pencil. Since I'm not the world's best artist, I Googled "jack 'o lantern outlines" and found a TON. 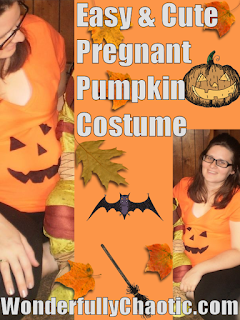 PumpkinLady.com has some great ones. I printed one out and used it as a guide. I got a large, flat book and stuck it inside my shirt to keep it nice and smooth while drawing. After sketching out the outline, I simply filled it in with my black marker. I let it dry for a few hours and then voila! I added a pair of black leggings and flats and voila, my costume was complete. It was quick, easy, and I actually got quite a few compliments on it! If you end up using this idea, please share your pictures in the comments!